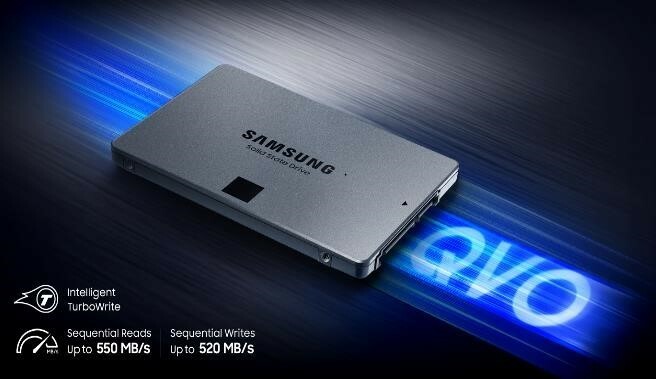 Singapore – Nov. 28, 2018 – Samsung Electronics Co., Ltd has today unveiled its new consumer solid state drive (SSD) — the Samsung 860 QVO SSD — featuring up to four terabytes (TB) of storage capacity with exceptional speed and reliability. Built on the company’s high-density 4-bit multi-level cell (MLC) NAND flash architecture, the 860 QVO makes terabyte capacities more accessible to the masses at approachable price points. Mainstream PC users handling large multi-media content often need to upgrade their PC’s storage to improve everyday computing experience. Based on the commonly used SATA interface and 2.5-inch form factor, the 860 QVO fits perfectly in most standard laptops and desktops. Also, by offering both high capacity and performance in a single, affordable drive, the 860 QVO eliminates the need to use a combination of a SSD and a HDD for booting and storage. Featuring sequential read and write speeds of up to 550 megabytes per second (MB/s) and 520 MB/s, respectively, the 860 QVO achieves the same level of performance as today’s 3-bit MLC SSD, thanks to Samsung’s latest 4-bit V-NAND and the proven MJX controller. The drive is also integrated with Intelligent TurboWrite technology2, which helps to accelerate speeds while maintaining high performance for longer periods of time. For optimal reliability, Samsung provides total bytes written based on a thorough analysis of consumers’ SSD usage patterns: a three-year limited warranty or up to 1,440 terabytes written (TBW) for the 4TB version, and 720 TBW and 360 TBW for the 2TB and 1TB versions, respectively3. The 860 QVO will be available locally from January 2018, with a manufacturer’s suggested retail price (MSRP) starting at S$299 for the 1TB model, S$659 for the 2TB model and S$999 for the 4TB model. For more information, please visit samsung.com/ssd or samsungssd.com. The Intelligent TurboWrite technology adjusts the buffer size to optimal levels within the usable disk space; up to 42GB for 1TB model and up to 78GB for 2TB and 4TB models. For more information on TurboWrite, please visit www.samsungssd.com. 3 years or TBW, whichever comes first. For more information on warranty, please find the enclosed warranty statement in the package. A certain portion of capacity may be used for system file and maintenance use, so the actual capacity may differ from what is indicated on the product label. Samsung Electronics shall not be liable for any loss, including but not limited to loss of data or other information contained on Samsung Electronics product or loss of profit or revenue which may be incurred by user. For more information on the warranty, please visit www.samsung.com/ssd.